We made these special updates thanks to your suggestion! This minor change will make a big difference and help make your Voki Presenter experience more valuable. 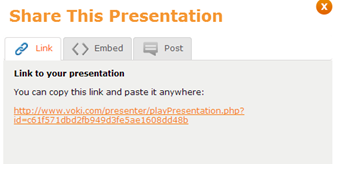 Voki Presenter users can grab the direct link and paste it anywhere to share it. 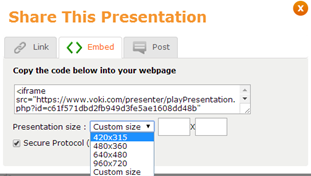 Or, Voki Presenter users can grab the embed code and paste it into your webpage or class site by selecting a Presentation size. 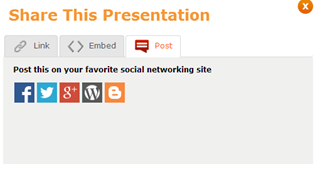 We are also giving users the option to post it on their favorite social media website. We love to hear what you think about this new update! Let us know by sending an email to feedback@voki.com! i´ve sent a message to my college pupils in my virtual classroom with a voki and i´ve invited them to answer me via the same way. i expect receive lots of vokis in the next days.